In this May 3, 2017, photo, a ranger takes care of Sudan, the world's last male northern white rhino, at the Ol Pejeta Conservancy in Laikipia county in Kenya. 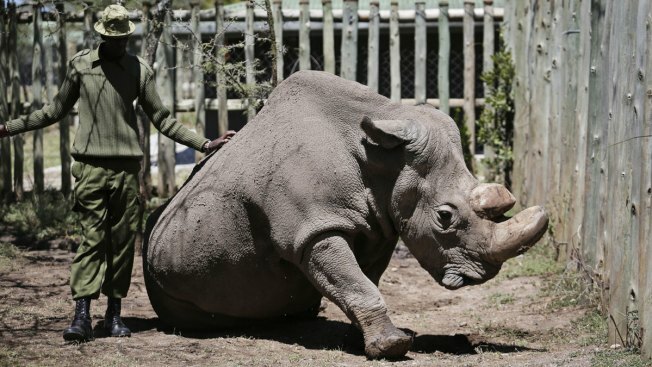 Sudan died after "age-related complications," researchers announced Tuesday, March 20, 2018, saying he "stole the heart of many with his dignity and strength." Scientists say they're several steps closer to perfecting a method for saving the northern white rhino from extinction. Writing in the journal Nature Communications, researchers said Wednesday they've succeeded in creating embryos using frozen northern white rhino sperm and eggs from a southern white rhino. It's the first time such hybrid embryos have been created, and the scientists from Europe and the United States hope it will provide a pathway to saving the northern white rhino sub-species, of which only two females remain. They plan to harvest the females' egg cells soon and produce "pure" northern white rhinos to be borne by a southern white surrogate in three years. They're also working on a second method that would see sperm and eggs produced from preserved cells of northern white rhinos.